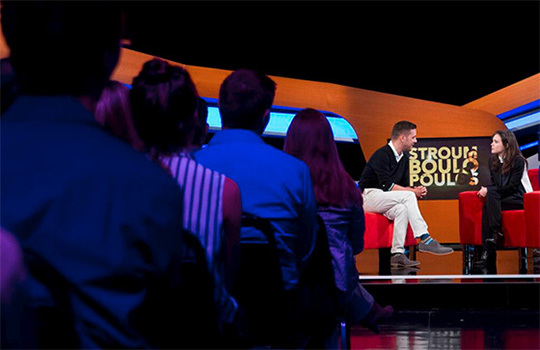 With a mouth full of a name that’s very similar to another famous TV news personality, George Stroumboulopoulos hit the US airwaves after many years of interviewing in Canada. CNN debuted his new self-titled show Sunday from Los Angeles with a new studio that’s very warm, inviting and modern. Featuring a studio audience, the show is a move into a warmer and gentler direction for CNN. We’ll see how long this lasts and if Americans can grasp his name. The set features curved wood elements with inlayed backlit plexiglass elements. 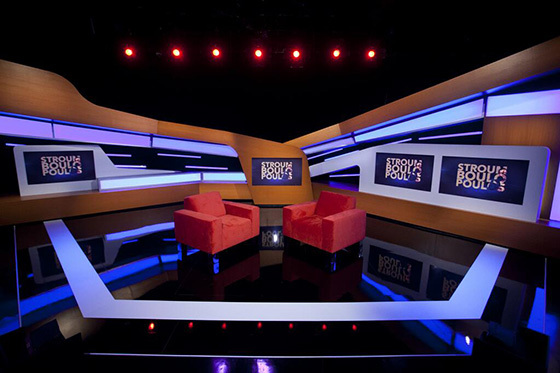 Branding is provided on the set by four large monitors. Stroumboulopoulos and his guest takes center stage in two bright red chairs, which actually look a bit cheap compared to the surroundings. Overall, the set is different for CNN. Out is metal, in is wood. This is CNN’s second set under new boss Jeff Zucker, so we’ll see if they continue to grow warmer and friendlier, adopting more a look ala CNN 2003-2008. The set was designed by Jeff Hall Design.